When people ask the difference between Mustang GT and Mustang Shelby GT is that a 4.6l Ford Mustang is that it is much lower in horsepower, it is more like a basic pleasure car while the Cobra is a true American made muscle car. The legendary racer and automotive designer Carroll Shelby passed away earlier this year, but the spirit of this automotive icon is on display during the Pebble Beach weekend with the 50th Anniversary of the Cobra and now this...a one-of-a-kind Shelby GT500 Cobra. It has been created as a special tribute to the man who did everything from winning the 1959 24 Hours of Le Mans in an Aston Martin DBR1, to taking on the might of Ferrari with his incredible Ford-powered Cobra roadsters and Daytona coupes. 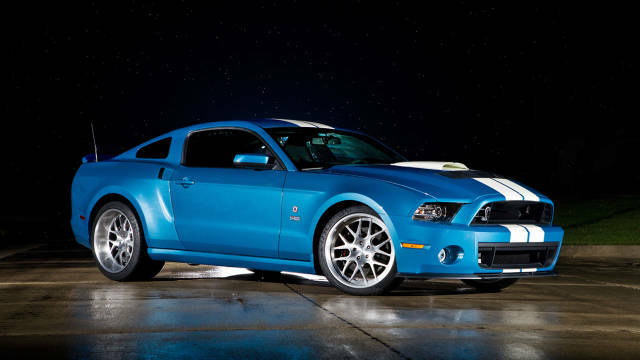 Any car trying to live up to the Shelby name has its work cut out for it. But in this case, we think the straight-talking Texan would have definitely approved the 850-bhp V-8 stuffed into the nose of this Guardsman Blue and Wimbledon White GT500 Cobra.